UPDATE: Unfortunately, the video chat service provided in Canvas was turned off in Fall 2012. It has now been replaced with a Text Chat that is built in to Canvas, but no video. I have been incredibly happy with the online office hours that I’ve been holding in Canvas this semester (see previous post on SAVI tools in Canvas here). Day after day, students are showing up for office hours to ask their own questions, hear other students’ questions, and just kind of hang out while they work on problems. It’s lovely to SEE my online students regularly and I feel a much greater connection to this summer’s students than from any prior semester. I’m quite sure that the difference is the ease of use of the Canvas Chat tool. There are no logins, no scheduled sessions, and there is no separate software to install. To get into the online office hour, the student (and the instructor) simply has to click on Chat. To share camera and/or audio, they click “Start Broadcasting” and follow the prompts. It really does not get much easier than that. 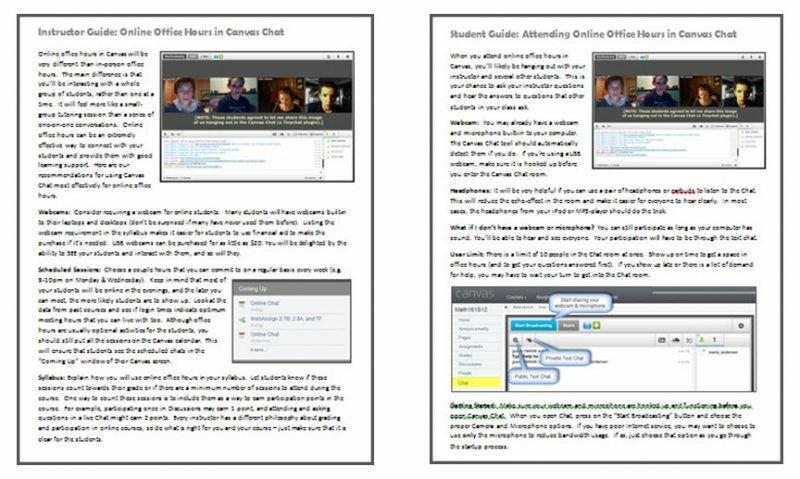 Images of Instructor and Student Guides for Online Office Hours in Canvas. Click on image to enlarge. Follow links in blog post for actual documents. Webcams: Should you require or not? Scheduling sessions: When and how? If you’re going to share these with colleagues or students (which is fine), please share through the hyperlink so that if I update the documents in the future, you’ll always have the current version. Hope these are helpful to you!